Make a Great Presentation with Small Custom Boxes! Made of durable, heavy 18 pt card stock, these boxes can hold just about anything! From stationary and office supplies, to gifts and party favors, a full color self-tuck box is sure to add appeal and leave a lasting impression. We offer self-tuck folded box printing with high-quality materials, vivid full color, and premium coating. Select from a variety of dimensions to fit your desired contents. These custom self-tuck boxes are easy-to-use with a self-tuck mechanism for closure and a tab for opening. Tape, glue or other sealant is not required for assembly. The boxes are shipped flat to economize space and prevent damage in transit. Our low cost self-tuck folded boxes are available in both short-run and high quantity printing to suit any of your packaging needs. Well-designed, self-tuck folded boxes printed in full color are so striking, your customers, party guests or gift recipients will want to use them again and again! Choose from our variety of sizes such as full color medium box packaging printing or custom made rectangular box packaging printing. Custom self-tuck boxes can be used for a variety of personal, business and promotional purposes. When it comes to designing your full color self-tuck folded box, you’re only limit is your imagination! Our high-resolution, full-color printing will add beauty and appeal to any graphics and design for your custom self-tuck folded boxes. If you are a small business owner, unique packaging can make a huge impact on the brand recognition of your company and products. Whether you offer a mailing service or simply want to add more appeal to your in-store items, vivid and stunning self-tuck boxes will attract customers to your products and increase sales. Design a full-color self-tuck box that reflects the style or atmosphere of your business or products, and customers will appreciate that they have an amazing free item to re-use as storage. Consider full-color self-tuck box printing with added high gloss UV coating for that brilliant shine, and watch as your company gains more exposure. Self-tuck folded boxes are ideal for storing stationary while adding aesthetic appeal to any desk or cubicle. Give out custom self-tuck boxes filled with stationary supplies to newly hired employees or around the holidays to show appreciation. 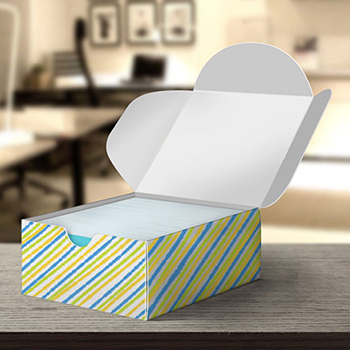 These self-tuck boxes are the perfect size to store business cards in for great presentation. When throwing a party or event where many guests will be in attendance, it is almost always necessary to pass out favors. Custom self-tuck boxes are perfect for presenting gifts or favors to impress and amaze your guests before they even see what’s inside! Our stunning, premium full-color self-tuck boxes when exquisitely designed are truly a gift within themselves. These boxes look great! My staff keeps their business cards inside and we get a lot of compliments from clients. Thank you very much! Nice boxes with a smooth, velvety finsih. All my specifications were met exactly how i wanted. Thanks! Boxes are durable and printed images look bright. I would recommend this company. What finishing options does this product have? This product has a UV finishing option which is free of cost. It also has spot UV which gives shine to particular sections. You can also chose not to have any coating on this product. 18 pt Card Stock Coated on One Side 18 pt card stock is a heavy premium card stock that is durable and folds to hold items. The coating is applied to the full-color side before printing to provide a smooth surface and excellent ink absorption. UV Coating UV coating is added as a separate finishing. This gives the ultimate shine, is fade-resistant and adds more protection to the card stock.